Porcelain age signs give us an opportunity to determine whether a ceramic item is really antique or recently made. Age characteristics can be fake, but the average age faking can be detected by knowledgable collectors or dealers. If a piece of China shows no visible age signs at all, we consider it as recently made. On the other hand, if there are too many age signs present it is necessary to carefully check in detail to make sure the item is not a fake. But, you need to be aware that the age signs of ceramics are different from those of other antiques. You cannot come and decide age because an item looks old or gives the feeling of age. Glaze and decoration do not get discolored under normal circumstances with porcelain, even over extended periods of time. An exception are items that have been in the soil or sea for long periods of time. With shipwreck porcelain that has been in the water for less than 200 years, many items are still in superb condition now and may show little discoloration. Shipwreck items that have been in the sea for several hundred years often have little or no glaze left. Without its protective cover gone the decoration color of porcelain can change. With blue and white porcelain often a diluted blue color and overall white appearance is the result. Crackles may be another exception... 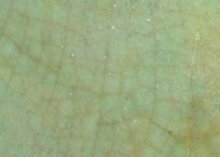 The crackle lines can turn yellowish brown with age. But careful, crackles can be and are created artificially since ancient times, and lend themselves for making an item look old. It is necessary to always check carefully whether the porcelain age signs are genuine or made to deceive unsuspecting buyers. 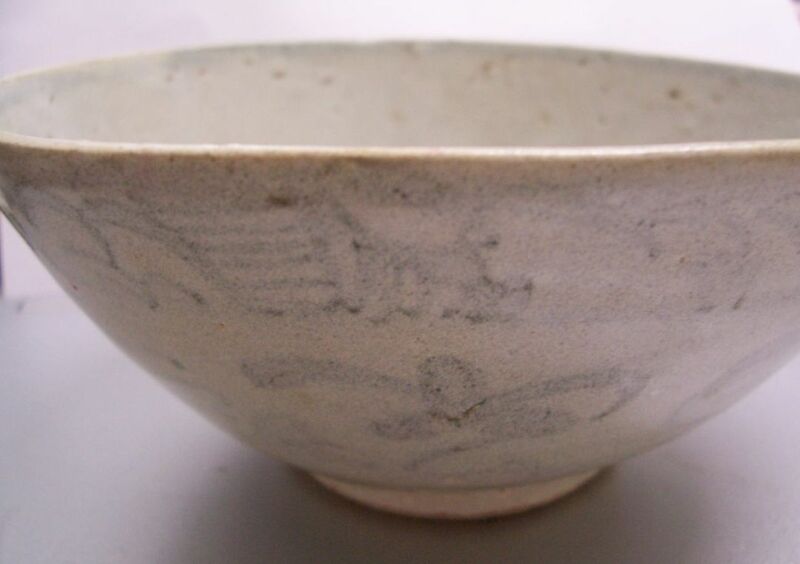 In fact the Ge wares of the Song dynasty (960-1279) were made exclusively with crackles as decoration. Such wares were made throughout the history of Chinese porcelain. Shown below is the crackled surface of a Ming dynasty jar. These are not artificially induced crackles. Iron residue contained in the clay moves slowly to the surface of the ceramic body over a long period of time, forming small rust spots. On rare occasions these may be larger, but mostly they appear as tiny spots. Rust spots may look black to the eye if small, but are light brown if larger. Glaze contractions can be a porcelain age sign, but not in the sense of the porcelain having "aged". Instead, they are rather symptoms of kiln conditions at the time of manufacture. 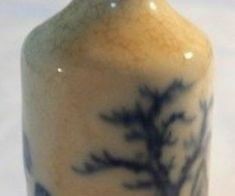 Glaze contractions are found in early porcelain, as for example in Ming dynasty porcelain, but also in items made as late as the early 20th century. They can be considered as "indirect" porcelain age signs, an indication of the production environment at the time the porcelain was manufactured. However, it might be preferable to think of them as a sign of the manufacturing period or era, when kiln conditions were such that glaze contractions developed on porcelain. The absence of such contractions when there should be some for the period concerned might mean that an item is not of the period (i.e. made later). Many porcelain items of the 18th century do not show glaze contractions. If an item looks as if it were from the 18th century, but has glaze contractions, we need to evaluate whether these could be fake. Glaze contractions are small spots where a hole or recess appears on the surface of Chinese porcelain. They have a relatively simple explanation. From the end of the Ming dynasty and beginning of the Qing dynasty (17th century) the kilns were able to control quality better. By the Qianlong period, in the second half of the 18th century, quality was at its peak and many defects had virtually disappeared. However, after the Qianlong period internal strife and the opium wars, etc. were cause for a decrease in quality. This would have been mainly due to the loss of skilled kiln workers who may have not been paid or fled to avoid harm. One of the main causes is some oily or fatty substance sticking to the clay surface before the glaze was applied. The glaze covers that substance but not the body itself. In the high temperature of the kiln the adhering material evaporates as it has a low point of evaporation or combustion. This leaves a spot without glaze on the body. The melting glaze will flow into that empty spot sometimes; depending on the glaze thickness of the surrounding area the empty spot may not or only partially be filled. This results in a concave spot or miniscule hole in the glaze. In some cases the spots are very shallow and only visible if viewed from an angle, depending on the light conditions. Deeper contraction spots may be brown or black because of sediments or residual dirt inside. Chinese porcelain exceeding a certain age normally shows some glaze contractions. If there are none at all on the whole body or bottom, better check carefully for rust spots or other age signs. The item may not be that old if nothing at all is found. Always also check also the bottom and inside of vessels. See firing faults. Gilt and other "on-glaze" decoration normally shows wear if a porcelain item has been in actual use rather than on display only. The presence or absence of certain colors in the decoration can be indicative of the period of manufacture. As such these can be used in the same way as other porcelain age signs. Keep in mind that some colors were not available until later in the Qing dynasty, or were only used during certain periods, or for certain items. Certain colors were available for decorating porcelain only after materials or techniques were developed, later on in the Qing dynasty, which made it possible for the colors to remain visible after firing in the kiln.